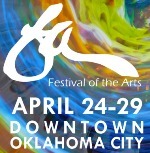 The Arts Council of Oklahoma City’s 46th Annual Festival of the Arts continues through Sunday in downtown OKC. Nearly every kind of art is represented including culinary arts, performing arts, and visual arts. Hundreds of artists and vendors take over the Festival Plaza and Myriad Botanical Gardens for this spring event. A Youth Plaza just for children hosts a Youth Art Sale and artistic activities like tie-dying and jewelry making. The festival is open from 11:00 a.m. to 9:00 p.m. through Saturday, and from 11:00 a.m. to 6:00 p.m. on Sunday. Downtown Norman hosts the fifth annual Norman Music Festival from April 26th through the 28th. Main Street becomes home to fans and bands of all different genres of music from hip hop to metal. There is no lack of entertainment with performances at 21 stages over the course of the festival. Local talent takes a spot light this year as Norman based Rainbows are Free performs on the Main Stage Saturday afternoon, followed by the festival’s headliners Other Lives and Portugal. The Man. Performances begin at 5:00 p.m. on Thursday, 4:30 p.m. on Friday, and Noon on Saturday. The University of Oklahoma School of Musical Theatre and University Theatre bring one of the greatest imaginations to life on stage. “Seussical the Musical” premiered on Broadway in 2000, and can be described as a “complex amalgamation of many of Dr. Seuss's most famous books.” Characters such as The Cat in the Hat, Horton the Elephant, and the Whos from Whoville are brought together for a completely new story. Performances take place in the Rupel Jones Theatre on the OU campus from April 27th through May 6th. The Harding Fine Arts Academy Drama Department performs “Hairspray” for two nights only this Friday and Saturday. Set in Baltimore, Maryland in the early 1960s, the musical tells the story of Tracy Turnblad as she attempts to become a dancer on a popular television program, overcome societal expectations, and impress a boy from school. The Broadways show ran for seven years, and is an adaptation of the 1988 John Waters film of the same name. The Harding Fine Arts Academy transports its audience back to 1962 at 7:00 p.m. in Oklahoma City. The Richter Uzur Duo performs at various Metropolitan Library System libraries from April 26th through the 28th. They combine cello and guitar in unique ways, performing all genres of music from classical to rock and folk.